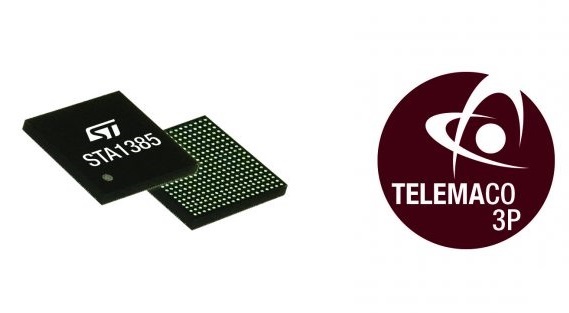 STMicroelectronics has teamed up with Virscient to help system designers build automotive solutions using ST’s Telemaco3P secure telematics and connectivity processors. 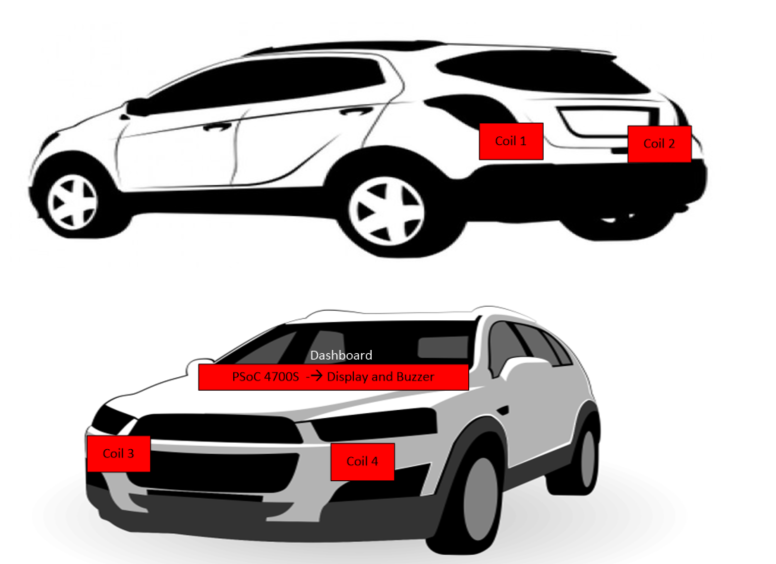 Virscient offers support to ST customers in the development and delivery of advanced automotive applications based on the ST Modular Telematics Platform (MTP). MTP is a comprehensive development and demonstration platform incorporating ST’s Telemaco3P telematics and connectivity microprocessor. MTP enables the rapid prototyping and development of smart-driving applications, including vehicle connectivity to back-end servers, road infrastructure, and other vehicles. Virscient brings a deep understanding of wireless connectivity technologies and protocols ideal for architecting connected-car systems that rely on technologies such as GNSS (Precise Positioning), LTE/cellular modems, V2X technologies, Wi-Fi, Bluetooth and Bluetooth Low Energy (BLE). 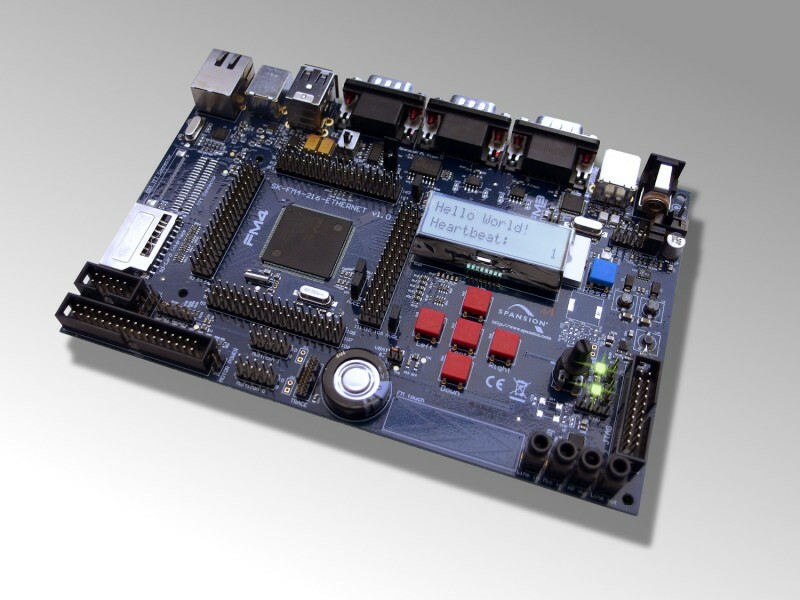 The Telemaco3P incorporates dual Arm Cortex-A7 processors with an embedded Hardware Security Module (HSM), an independent Arm Cortex-M3 subsystem, and a rich set of connectivity interfaces. With security at its core, and considerable flexibility in both hardware and software configurations, the Telemaco3P provides an excellent platform for connectivity within the vehicular environment. ST’s Telemaco3P system-on-chip is designed as a solution for ensuring a secure connection between the vehicle and the Cloud. Its asymmetric multi-core architecture provides powerful application processors as well as an independent CAN control subsystem with optimized power management. Its ISO 26262 silicon design, its embedded Hardware Security Module, and automotive-grade qualification up to 105°C ambient temperature make it well suited for implementing a wide range of secure telematics applications supporting high-throughput wireless connectivity and over-the-air firmware upgrades. As automotive dashboard displays get more sophisticated, information and entertainment are merging into so-called infotainment systems. 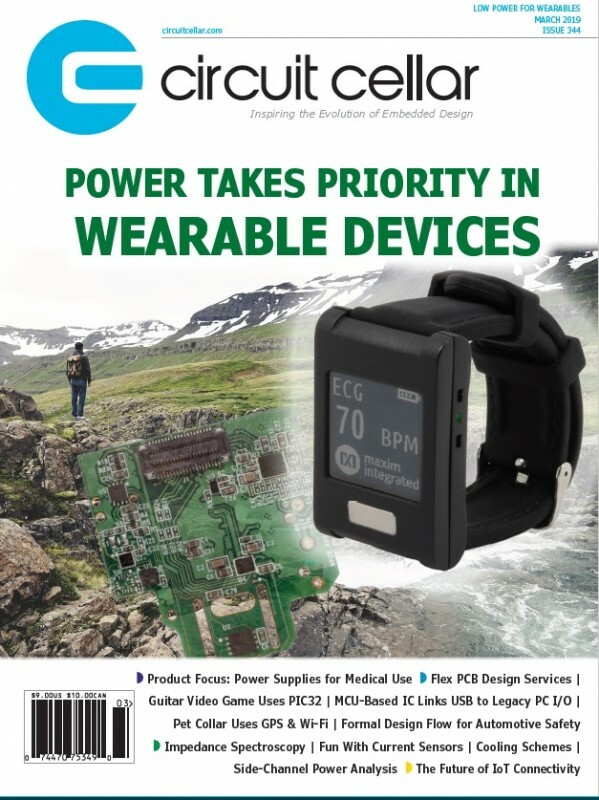 The new systems are driving a need for powerful MCU solutions that support the connectivity, computing and interfacing requirements particular to these designs. (Caption for lead image Figure 1: The Cypress Wi-Fi and Bluetooth combo solution uses Real Simultaneous Dual Band (RSDB) technology so that Apple CarPlay (shown) and Android Auto can operate concurrently without degradation caused by switching back and forth between bands.). Microcontroller (MCU) vendors have a rich legacy of providing key technologies for nearly every aspect of an automobile’s electronics—everything from the powertrain to the braking system to dashboard displays. In recent years, they’ve taken on a new set of challenges as demands rise for ever more sophisticated “infotainment” systems. Advanced touchscreen, processing, networking, voice recognition and more are parts of these subsystems tasked with providing drivers with information and entertainment suited to today’s demands—demands that must rival or exceed what’s possible in a modern smartphone or tablet. And, as driverless cars inch toward mainstream reality, that hunger for rich infotainment functionality will only increase. 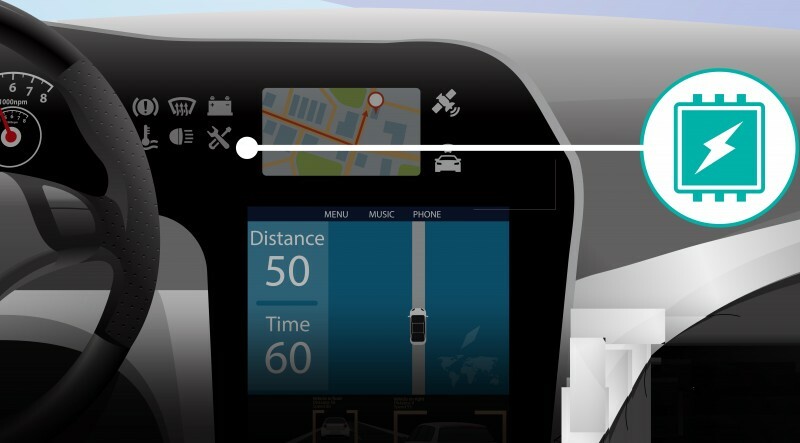 In order to meet those system design needs, MCU vendors are keeping pace with highly integrated chip-level solutions and embedded software tailored specifically to address various aspects of the automotive infotainment challenge. 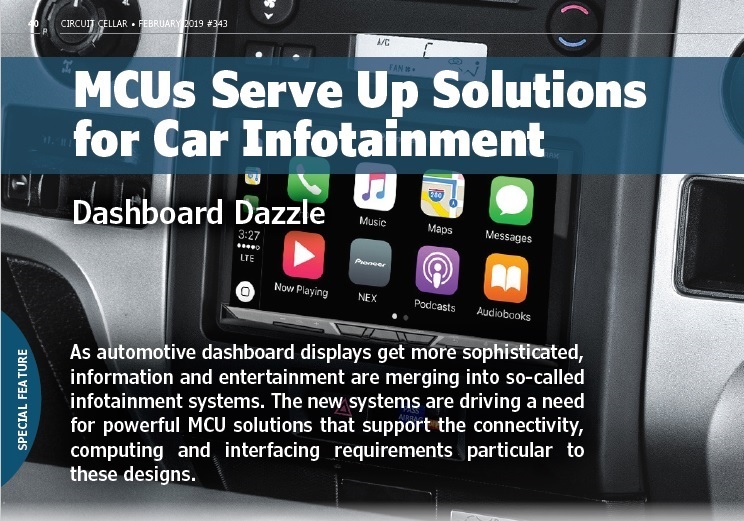 Over the past 12 months, MCU companies have announced products aimed at everything from advanced dashboard graphics to connectivity solutions to security technologies. At the same time, many have announced milestone design wins that illustrate their engagement with this dynamic sub-segment of automotive system development. 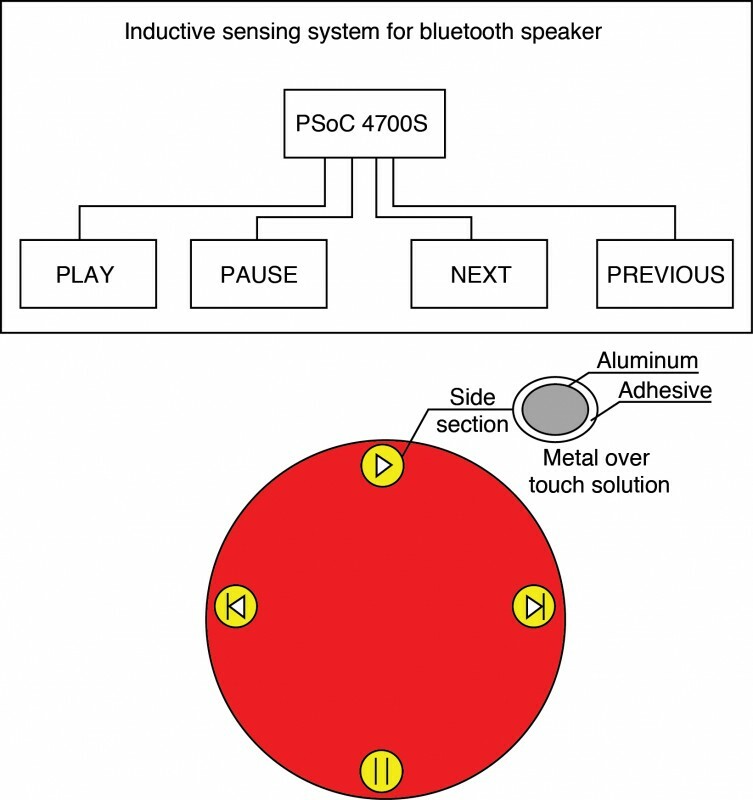 Exemplifying these trends, in July Cypress Semiconductor announced that Pioneer integrated Cypress’ Wi-Fi and Bluetooth Combo solution into its flagship in-dash navigation AV receiver. The solution enables passengers to display and use their smartphone’s apps on the receiver’s screen via Apple CarPlay (Figure 1–lead image above) or Android Auto, which provide the ability to use smartphone voice recognition to search for information or respond to text messages. The Cypress Wi-Fi and Bluetooth combo solution uses Real Simultaneous Dual Band (RSDB) technology so that Apple CarPlay and Android Auto can operate concurrently without degradation caused by switching back and forth between bands. The Pioneer AVH-W8400NEX receiver uses Cypress’ CYW89359 combo solution, which includes an advanced coexistence engine that enables optimal performance for dual-band 2.4- and 5-GHz 802.11ac Wi-Fi and dual-mode Bluetooth/Bluetooth Low Energy (BLE) simultaneously for advanced multimedia experiences. The CYW89359’s RSDB architecture enables two unique data streams to run at full throughput simultaneously by integrating two complete Wi-Fi subsystems into a single chip. 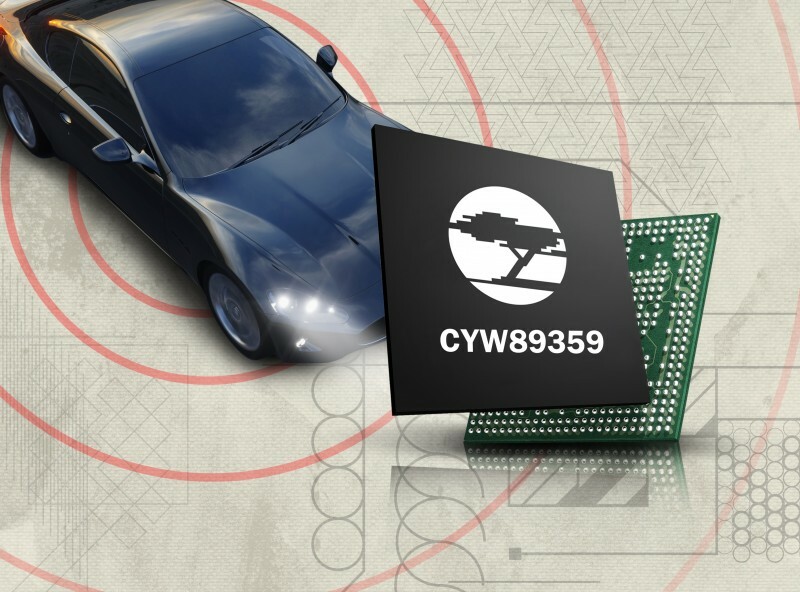 The CYW89359 is fully automotive qualified with AECQ-100 grade-3 validation and is being designed in by numerous top-tier car OEMs and automotive suppliers as a full in-vehicle connectivity solution, supporting infotainment and telematics applications such as smartphone screen-mirroring, content streaming and Bluetooth voice connectivity in car kits. In October, Cypress announced another infotainment-related design win with Yazaki North America implementing Cypress’ instrument cluster solution to drive the advanced graphics in Yazaki’s instrument cluster for a leading American car manufacturer. According to Cypress, Yazaki selected the solution based on its unique offering of five chips that combine to drive dual displays and provide instant-on memory performance with automotive-grade, ASIL-B safety compliance. The Cypress solution is based on a Traveo MCU, along with two high-bandwidth HyperBus memories in a multi-chip package (MCP), an analog power management IC (PMIC) for safe electrical operation, and a PSoC MCU for system management support. The Traveo devices in the Yazaki instrument cluster were the industry’s first 3D-capable Arm Cortex-R5 cluster MCUs. The complexity of automotive infotainment systems has pushed system developers to embrace advanced operating system approaches such as virtualization. Feeding those needs, last June Renesas Electronics rolled out its “R-Car virtualization support package” designed to enable easier development of hypervisors for the Renesas R-Car automotive system-on-chip (SoC). The R-Car virtualization support package includes, at no charge, both the R-Car hypervisor development guide document and sample software for use as reference in such development for software vendors who develop the embedded hypervisors that are required for integrated cockpits and connected car applications. A hypervisor is a virtualization operating system (OS) that allows multiple guest OSs— such as Linux, Android and various real-time OSs (RTOS)—to run completely independently on a single chip. Renesas announced the R-Car hypervisor in April of 2017 and the new R-Car virtualization Support Package was developed to help software vendors accelerate their development of R-Car hypervisors. The company’s third-generation R-Car SoCs were designed assuming that they would be used with a hypervisor. The Arm CPU cores, graphics cores, video/audio IP and other functions include virtualization functions. Originally, for software vendors to make use of these functions, they would have had to understand both the R-Car hardware manuals and the R-Car virtualization functions and start by looking into how to implement a hypervisor. Now, by following development guides in the R-Car virtualization support package, not only can software vendors easily take advantage of these functions, they will be able to take full advantage of the advanced features of R-Car. Also, by providing sample software that can be used as a reference, this package supports rapid development. Technology partnerships have been playing a key role in automotive infotainment trends. 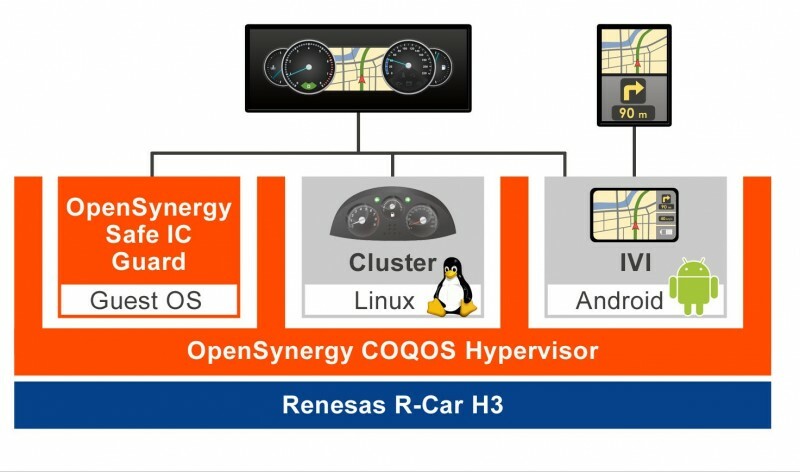 Along just those lines, in September Renesas and OpenSynergy, a supplier of automotive hypervisors, announced that the Renesas’ SoC R-Car H3 and OpenSynergy’s COQOS Hypervisor SDK were adopted on Parrot Faurecia’s automotive safe multi-display cockpit. The latest version of Android is the guest OS of the COQOS Hypervisor, which executes both the instrument cluster functionality, including safety-relevant display elements based on Linux, and the Android-based in-vehicle infotainment (IVI) on a single R-Car H3 SoC chip (Figure 2). The COQOS Hypervisor SDK shares the R-Car H3 GPU with Android and Linux allowing applications to be presented on multiple displays, realizing a powerful and flexible cockpit system. With Android as the guest OS of the COQOS Hypervisor, it executes both the instrument cluster functionality, including safety-relevant display elements based on Linux, and the Android-based in-vehicle infotainment (IVI) on a single R-Car H3 SoC chip. According to OpenSynergy’s CEO Stefaan Sonck Thiebaut, the COQOS Hypervisor SDK takes full advantage of the hardware and software virtualization extensions provided by Renesas. The OpenSynergy solution includes key features, such as shared display, which allows several virtual machines to use multiple displays flexibly and safely. The R-Car H3 GPU and video/audio IP incorporates virtualization functions, making virtualization by the hypervisor possible and allowing for multiple OSs to operate independently and safely. OpenSynergy’s COQOS Hypervisor SDK is built around a safe and efficient hypervisor that can run software from multipurpose OSs such as Linux or Android, RTOS and AUTOSAR-compliant software simultaneously on one SoC. As the content provided by automotive infotainment systems gets more sophisticated, so too must the displays and user interface technologies that interact with that content. With that in mind, MCU vendors are offering more advanced touchscreen control solutions. Dashboard screens have unique design challenges. Screens in automobiles need to meet stringent head impact and vibration tests. That means thicker cover lenses that potentially impact the touch interface performance. Meanwhile, as screens get larger, they are also more likely to interfere with other frequencies such as AM radio and car access systems. 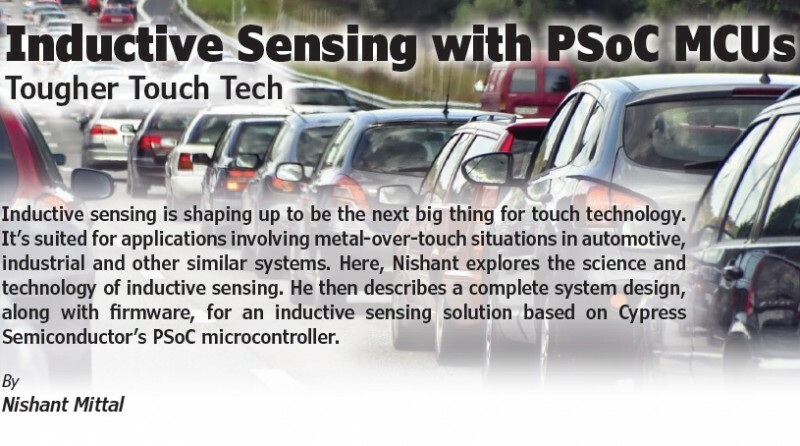 All of these factors become a major challenge in the design of modern automotive capacitive touch systems. Along just those lines, Microchip in December announced its maXTouch family of single-chip touchscreen controllers designed to address these issues for screens up to 20 inches in size (Figure 3). The MXT2912TD-A, with nearly 3,000 touch sensing nodes, and MXT2113TD-A, supporting more than 2,000 nodes, bring consumers the touchscreen user experience they expect in vehicles. These new devices build upon Microchip’s existing maXTouch touchscreen technology that is widely adopted by manufacturers worldwide. Microchip’s latest solutions offer superior signal-to-noise capability to address the requirements of thick lenses, even supporting multiple finger touches through thick gloves and in the presence of moisture. 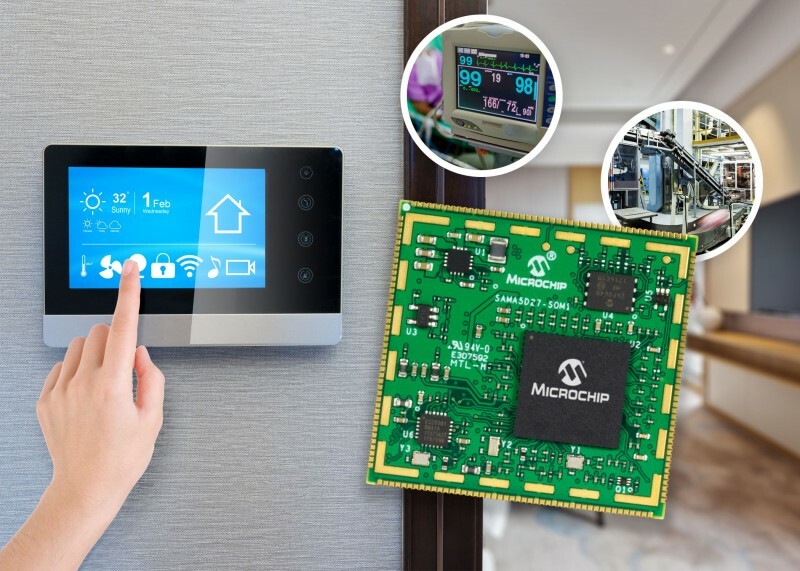 The maXTouch family of single-chip touchscreen controllers is designed for screens up to 20 inches in size, and supports up to 3,000 touch sensing nodes. The devices even support multiple finger touches through thick gloves and in the presence of moisture. The new devices feature technology that enables adaptive touch utilizing self-capacitance and mutual-capacitance measurements, so all touches are recognized and false touch detections are avoided. They also feature Microchip’s proprietary new signal shaping technology that significantly lowers emissions to help large touchscreens using maXTouch controllers meet CISPR-25 Level 5 requirements for electromagnetic interference (EMI) in automobiles. The new touch controllers also meet automotive temperature grade 3 (-40°C to +85°C) and grade 2 (-40°C to +105°C) operating ranges and are AEC-Q100 qualified. Aside from the touchscreen display side of automotive infotainment, Microchip for its part has also put its efforts toward innovations in 3D human interface technology. With that in mind, in July the company announced a new 3D gesture recognition controller that offers the lowest system cost in the automotive industry, providing a durable single-chip solution for advanced automotive HMI designs, according to Microchip. The MGC3140 joins the company’s family of easy-to-use 3D gesture controllers as the first qualified for automotive use (Figure 4). 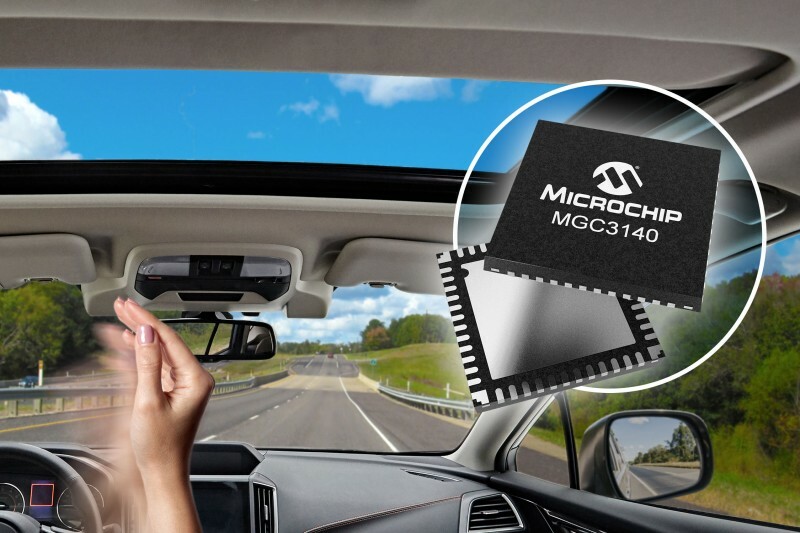 The MGC3140 3D gesture controller is Microchip’s first qualified for automotive use. It’s suited for a range for applications such as navigating infotainment systems, sun shade operation, interior lighting and more. Suited for a range for applications that limit driver distraction and add convenience to vehicles, Microchip’s new capacitive technology-based air gesture controller is ideal for navigating infotainment systems, sun shade operation, interior lighting and other applications. The technology also supports the opening of foot-activated rear liftgates and any other features a manufacturer wishes to incorporate with a simple gesture action. The MGC3140 is Automotive Electronics Council AEC-Q100 qualified with an operating temperature range of -40°C to +125°C, and it meets the strict EMI and electromagnetic compatibility (EMC) requirements of automotive system designs. Each 3D gesture system consists of a sensor that can be constructed from any conductive material, as well as the Microchip gesture controller tuned for each individual application. While existing solutions such as infrared and time-of-flight technologies can be costly and operate poorly in bright or direct sunlight, the MGC3140 offers reliable sensing in full sunlight and harsh environments. Other solutions on the market also come with physical constraints and require significant infrastructure and space to be integrated in a vehicle. The MGC3140 is compatible with ergonomic interior designs and enables HMI designers to innovate with fewer physical constraints, because the sensor can be any conductive material and hidden from view. While applicable to areas beyond infotainment, an automobile’s ability to network with the outside world has become ever more important. As critical vehicle powertrain, body, chassis, and infotainment features increasingly become defined by software, securely delivering updates such as fixes and option packs over the air (OTA) enhances cost efficiency and customer convenience. Serving those needs, in October STMicroelectronics released its latest Chorus automotive MCU that provides a gateway/domain-controller solution capable of handling major OTA updates securely. 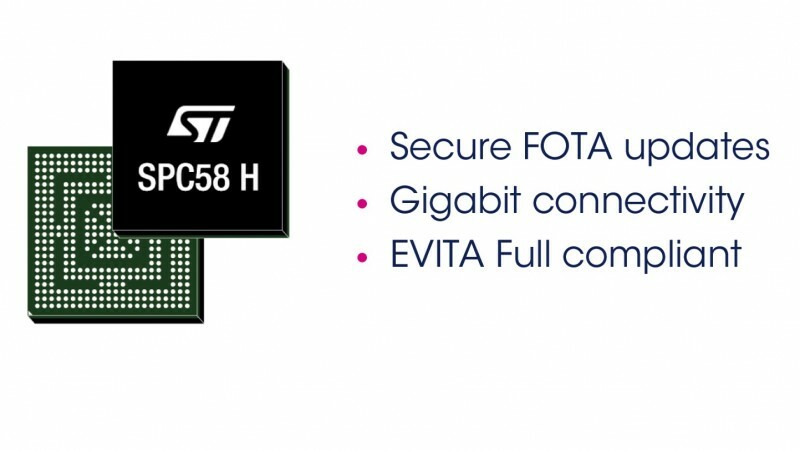 With three high-performance processor cores, more than 1.2 MB RAM and powerful on-chip peripherals, ST’s new flagship SPC58 H Line joins the Chorus Series of automotive MCUs and can run multiple applications concurrently to allow more flexible and cost-effective vehicle-electronics architectures (Figure 5). Two independent Ethernet ports provide high-speed connectivity between multiple Chorus chips throughout the vehicle and enable responsive in-vehicle diagnostics. Also featuring 16 CAN-FD and 24 LINFlex interfaces, Chorus can act as a gateway for multiple ECUs (electronic control units) and support smart-gateway functionality via the two Ethernet interfaces on-chip. The SPC58 H Line of MCUs can run multiple applications concurrently to allow more flexible and cost-effective vehicle-electronics architectures. Two independent Ethernet ports provide high-speed connectivity between multiple Chorus chips throughout the vehicle. To protect connected-car functionalities and allow OTA updates to be applied safely, the new Chorus chip contains a Hardware Security Module (HSM) capable of asymmetric cryptography. Being EVITA Full compliant, it implements industry-leading attack prevention, detection and containment techniques. Working with its large on-chip 10 MB flash, the SPC58NH92x’s context-swap mechanism allows current application code to run continuously even while an update is downloaded and made ready to be applied later at a safe time. The older software can be retained, giving the option to roll-back to the previous version in an emergency. Hyperbus and eMMC/SDIO high-speed interfaces to off-chip memory are also integrated, enabling further storage expansion if needed. Today’s automotive infotainment systems comprise mobile services, cross-domain communication and autonomous driving applications as part of in-vehicle networking. As a result, these systems require a more flexible solution for transporting packet, stream and control content. Existing implementations are either costly and cumbersome, or too limited in bandwidth and packet data capabilities to support system updates and internetworking requirements. To address this need, Microchip Technology in November announced an automotive infotainment networking solution that supports all data types—including audio, video control and Ethernet—over a single cable. Intelligent Network Interface Controller networking (INICnet) technology is a synchronous, scalable solution that significantly simplifies building audio and infotainment systems, offering seamless implementation in vehicles that have Ethernet-oriented system architectures (Figure 6). INICnet technology is a synchronous, scalable solution that significantly simplifies building audio and infotainment systems, offering seamless implementation in vehicles that have Ethernet-oriented system architectures. Audio is a key infotainment feature in vehicles, and INICnet technology provides full flexibility through supporting a variety of digital audio formats with multiple sources and sinks. INICnet technology also provides high-speed packet-data communications with support for file transfers, OTA software updates and system diagnostics via standard Ethernet frames. In this way, INICnet technology supports seamless integration of Internet Protocol (IP)-based system management and data communications, along with very efficient transport of stream data. INICnet technology does not require the development and licensing of additional protocols or software stacks, reducing development costs, effort and time. INICnet technology provides a standardized solution that works with both Unshielded Twisted Pair (UTP) at 50 Mbps and coaxial cable at 150 Mbps. With low and deterministic latency, INICnet technology supports deployment of complex audio and acoustics applications. Integrated network management supports networks ranging from two to 50 nodes, as well as processor-less or slim modules where the node is remotely configured and managed. The solution’s Power over Data Line (PoDL) capability saves costs on power management for microphones and other slim modules. Nodes can be arranged in any order with the same result, and any node in the system can directly communicate with any other node in the system. As cars become more network-connected, the issue of security takes on new dimensions. In October, Infineon Technologies announced a key effort in cybersecurity for the connected car by introducing a Trusted Platform Module (TPM) specifically for automotive applications—the first on the market, according to the company. The new OPTIGA TPM 2.0 protects communication between the car manufacturer and the car, which increasingly turns into a computer on wheels. 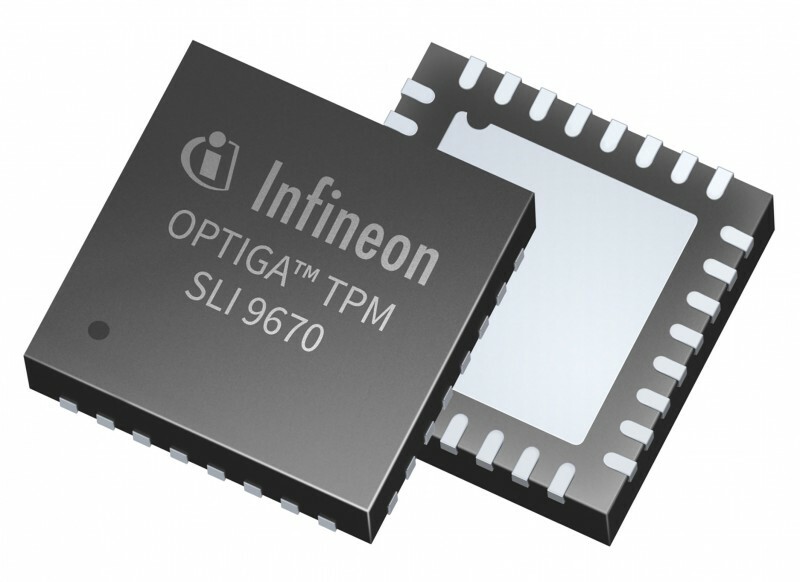 A number of car manufacturers already designed in Infineon’s OPTIGA TPM. Cars send real-time traffic information to the cloud or receive updates from the manufacturer “over the air,” for example to update software quickly and in a cost-effective manner. The senders and recipients of that data—whether car makers or individual components in the car—require cryptographic security keys to authenticate themselves. These critical keys are particularly protected against logical and physical attacks in the OPTIGA TPM as if they were in a safe. Incorporating the first or initial key into the vehicle is a particularly sensitive moment for car makers. When the TPM is used, this step can be carried out in Infineon’s certified production environment. After that, the keys are protected against unauthorized access; there is no need for further special security precautions. The TPM likewise generates, stores and administers further security keys for communication within the vehicle. And it is also used to detect faulty or manipulated software and components in the vehicle and initiate troubleshooting by the manufacturer in such a case. The SLI 9670 consists of an attack-resistant security chip (shown) and high-performance firmware developed in accordance with the latest security standard. The firmware enables immediate use of security features, such as encryption, decryption, signing and verification. The SLI 9670 consists of an attack-resistant security chip and high-performance firmware developed in accordance with the latest security standard (Figure 7). The firmware enables immediate use of security features, such as encryption, decryption, signing and verification. The TPM can be integrated quickly and easily in the system thanks to the open source software stack (TSS stack) for the host processor, which is also provided by Infineon. It has an SPI interface, an extended temperature range from -40°C to 105°C and the advanced encryption algorithms RSA-2048, ECC-256 and SHA-256. The new TPM complies with the internationally acknowledged Trusted Computing Group TPM 2.0 standard, is certified for security according to Common Criteria and is qualified in accordance with the automotive standard AEC-Q100. Side by side with driverless vehicle innovations, there’s no doubt that infotainment systems represent one of the most dynamic subsets of today’s automotive systems design. 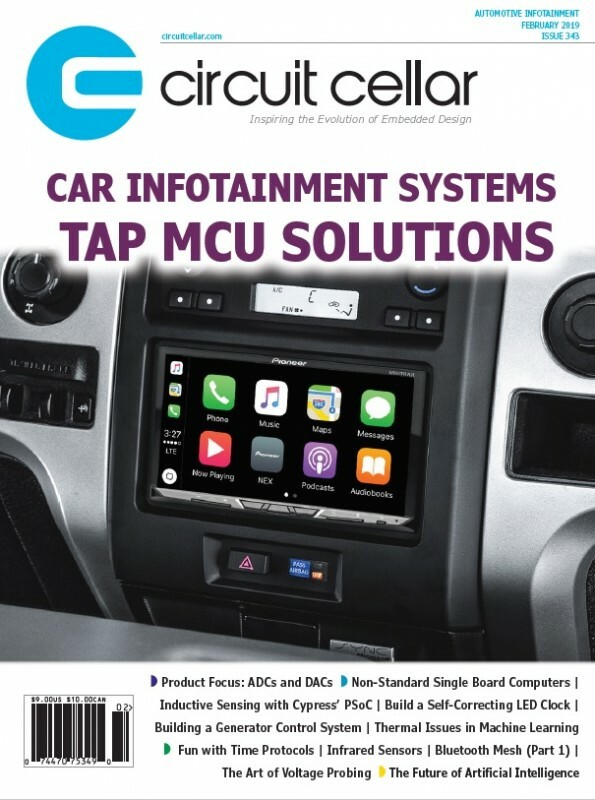 MCU vendors offer a variety of chip and software solutions addressing all the different pieces of car infotainment requirements from display interfacing to connectivity to security. Circuit Cellar will continue to follow these developments. And later this year, we’ll take a look specifically at MCU solutions aimed at enabling driverless vehicles and assisted driving technologies. IAR Systems has announced a major update of its development tools for Renesas automotive-focused RH850 microcontrollers. The latest version of the complete C/C++ compiler and debugger toolchain IAR Embedded Workbench for Renesas RH850 offers boosted user experience and extended capabilities through a number of new features. IAR Embedded Workbench for Renesas RH850 incorporates a compiler, a debugger, an assembler and a linker in one integrated development environment. It is available in several editions to suit different company needs, including a functional safety edition certified by TÜV SÜD according to IEC 61508, ISO 26262 and EN 50128. Renesas Electronics’ RH850 automotive MCU family includes rich functional safety and embedded security features needed for advanced automotive applications. Version 2.10 of IAR Embedded Workbench for Renesas RH850 adds compliance with the latest C language standard ISO/IEC 9899:2011 and the latest C++ standard ISO/IEC 14882:2014, ensuring high-quality, future-proof code. 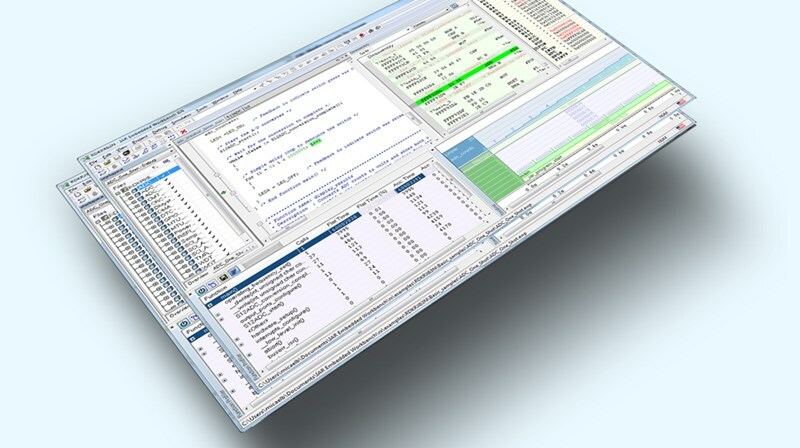 Renowned for producing very efficient code, the IAR C/C++ Compiler™ in IAR Embedded Workbench for Renesas RH850 now supports stack protection and stack usage analysis functionality. Available as an add-on for the toolchain is the static analysis tool C-STAT, which is now updated with a number of new checks. With these additions, developers building RH850-based applications are able to further strengthen code quality, stability and reliability in their embedded applications. 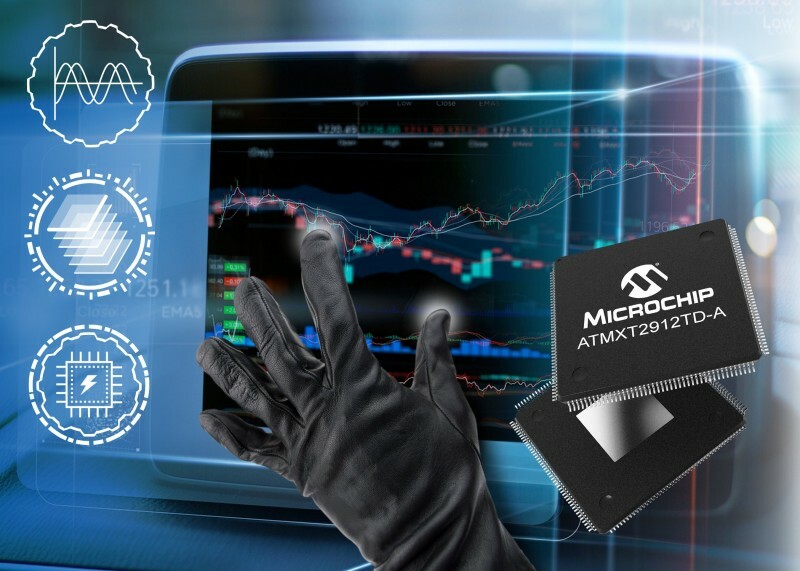 Microchip Technology has announced a new 3D gesture recognition controller that offers the lowest system cost in the automotive industry, providing a durable single-chip solution for advanced automotive HMI designs. 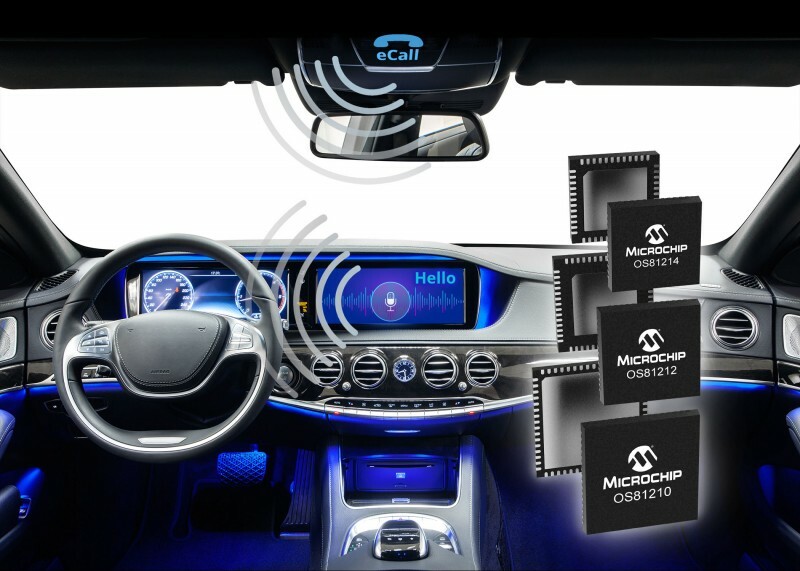 The MGC3140 joins Microchip’s family of easy-to-use 3D gesture controllers as the first qualified for automotive use. The MGC3140 is Automotive Electronics Council AEC-Q100 qualified with an operating temperature range of -40°C to +125°C, and it meets the strict electromagnetic interference (EMI) and electromagnetic compatibility (EMC) requirements of automotive system designs. Each 3D gesture system consists of a sensor that can be constructed from any conductive material, as well as the Microchip gesture controller tuned for each individual application. Car manufacturers are increasingly seeking ways to reduce driver distraction through implementing functional safety technology in vehicles. Many Human Machine Interface (HMI) designers are turning to gesture recognition as a solution to improve driver and vehicle safety without sacrificing interior design, adding features that allow drivers to easily control everything from switching on lights to answering phone calls while focusing on the road. While existing solutions such as infrared and time-of-flight technologies can be costly and operate poorly in bright or direct sunlight, the MGC3140 offers reliable sensing in full sunlight and harsh environments. Other solutions on the market also come with physical constraints and require significant infrastructure and space to be integrated in a vehicle. The MGC3140 is compatible with ergonomic interior designs and enables HMI designers to innovate with fewer physical constraints, as the sensor can be any conductive material and hidden from view. The Emerald evaluation kit provides a convenient evaluation platform for the 3D gesture recognition controller. The kit includes a reference PCB with the MGC3140 controller, a PCB-based sensor to recognize gestures, as well as all needed cables, software and documentation to support an easy-to-use user experience. All parts are compatible with Microchip’s Aurea software development environment which supports all Microchip 3D gesture controllers. The MGC3140 is available now in sampling and volume production quantities. Analog Devices has announced the Power by Linear LTC3372, an integrated power management solution for systems that require multiple low voltage outputs generated from an input voltage as high as 60 V. The LTC3372 features a 60 V synchronous buck switching regulator controller followed by four configurable synchronous monolithic buck regulators. This combination provides up to five high efficiency low quiescent current outputs in a single IC, well-suited for automotive, industrial and medical applications. The LTC3372’s buck controller operates over a 4.5 V to 60 V input voltage range and drives an all N-channel MOSFET power stage. Its output can be programmed to either 3.3 V or 5 V and can generate an output current up to 20 A. The controller output is typically used to feed the four monolithic buck regulators. Each monolithic buck channel can be programmed to regulate an output voltage as low as 0.8 V with a configurable output current up to 4 A. Eight 1 A integrated power stages are programmed by the C1-C3 pins into one of eight unique configurations, from a quad 2 A buck to a dual 4 A buck. This allows only one inductor per channel. The LTC3372 offers a low IQ solution ideal for battery-powered or automotive applications in which one or more power supply rails are always on. With just the high voltage controller enabled, the device draws 15 µA from a 12 V input supply while regulating the output to 5 V at no load. Each monolithic buck regulator adds only 8 µA of additional IQ per channel enabled. The LTC3372’s monolithic buck switching frequency can be programmed from 1 MHz to 3 MHz and can be synchronized to an external clock while the buck controller switches at 1/6 of this frequency. Additional features include foldback current limiting, soft-start, short-circuit protection and output overvoltage protection. The LTC3372 is available from stock in a thermally enhanced 48-pin 7 mm × 7 mm QFN package. E and I grades are specified over an operating junction temperature range of –40°C to 125°C, and the H grade features operation from –40°C to 150°C. Maxim Integrated Products has announced a series of power-management ICs (PMICs) that enable designers to optimize power for automotive advanced driver-assistance systems (ADAS) functions to achieve high performance, small size, efficiency and electrical protection. ADAS functions, many of which are now mandatory or will be soon, increase vehicle safety and enhance the driving experience. These features include smart braking for collision avoidance, GPS/navigation, adaptive cruise control, lane centering, lane-departure warning, and back-up/surround video. Although these functions receive considerable design attention, managing DC power in electrically harsh vehicle environments is a less-publicized yet critical challenge which involves significant issues of functions, features, performance, efficiency and footprint. Maxim’s array of application-optimized ICs, which manage DC power, solve the top-level designer pain points for various ADAS functions involving a combination of package size, operating efficiency, quiescent current, electrical protection, and EMI generation. Today’s crop of high-performance microcontrollers and embedded processors provide a rich continuum of features, functions and capabilities. Embedded system designers have many choices in both categories but the dividing line between the two can be blurry. At one time the world of microcontrollers and the world of microprocessors were clearly separate. That’s slowly changed over the years as the high-performance segment of microcontrollers have become more powerful. And the same time, embedded processors have captured ever more mindshare and market share that used to be exclusively owned by the MCU camp. The lines blurred even further once most all MCUs started using Arm-based processor cores. All the leading MCU vendors have a high-performance line of products, some in the 200 MHz and up range. Moreover, some application-specific MCU offerings are designed specifically for the performance needs of a particular market segment—automotive being the prime example. In some cases, these high end MCUs are vying for design wins against embedded processors that meet the same size, weight and power requirements as MCUs. In this article, we’ll examine some of the latest and greatest products and technologies on both sides. An example of an MCU vendor’s high-performance line of products is Cypress Semiconductor’s FM4. FM4 is a portfolio of 32-bit, general-purpose, high performance MCUs based on the Arm Cortex-M4 processor with FPU and DSP functionality. FM4 microcontrollers operate at frequencies up to 200 MHz and support a diverse set of on-chip peripherals for motor control, factory automation and home appliance applications. The portfolio delivers low-latency, reliable, machine-to-machine (M2M) communication required for Industry 4.0 using network-computing technologies to advance design and manufacturing. The FM4 MCU supports an operating voltage range of 2.7 V to 5.5 V. The devices incorporate 256 KB to 2 MB flash and up to 256 KB RAM. The fast flash memory combined with a flash accelerator circuit (pre-fetch buffer plus instruction cache) provides zero-wait-state operation up to 200 MHz. A standard DMA and an additional descriptor-based DMA (DSTC), each with an independent bus for data transfer, can be used to further offload the CPU. Figure 1 shows the FM4-216-ETHERNET, a development platform for developing applications using the Arm Cortex-M4-based FM4 S6E2CC MCU. The FM4-216-ETHERNET is a development platform for developing applications using the Arm Cortex-M4-based FM4 S6E2CC MCU. The high-performance line of MCUs from ST Microelectronics is its STM32H7 series. An example product from that series is the STM32H753 MCU with Arm’s highest-performing embedded core (Cortex-M7). According to ST Micro it delivers a record performance of 2020 CoreMark/856 DMIPS running at 400 MHz, executing code from embedded flash memory. Other innovations and features implemented by ST further boost performance.These include the Chrom-ART Accelerator for fast and efficient graphical user-interfaces, a hardware JPEG codec that allows high-speed image manipulation, highly efficient Direct Memory Access (DMA) controllers, up to 2 MB of on-chip dual-bank flash memory with read-while-write capability, and the L1 cache allowing full-speed interaction with off-chip memory. Multiple power domains allow developers to minimize the energy consumed by their applications, while plentiful I/Os, communication interfaces, and audio and analog peripherals can address a wide range of entertainment, remote-monitoring and control applications. Last year STMicro announced its STM32H7 high-performing MCUs are designed with the same security concepts as the Platform Security Architecture (PSA) from Arm announced at that time. 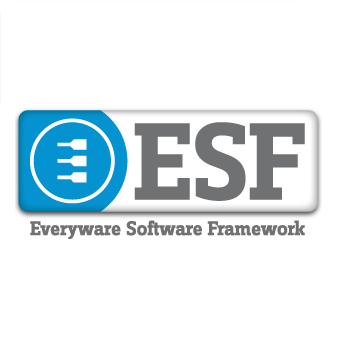 This PSA framework on the STM32H7 MCUs are combined with STM32-family enhanced security features and services. ST’s STM32H7 MCU devices integrate hardware-based security features including a True Random-Number Generator (TRNG) and advanced cryptographic processor, which will simplify protecting embedded applications and global IoT systems against attacks like eavesdropping, spoofing or man-in-the-middle interception. One dividing line that remains between MCUs and microprocessors is their ability to run major operating systems. 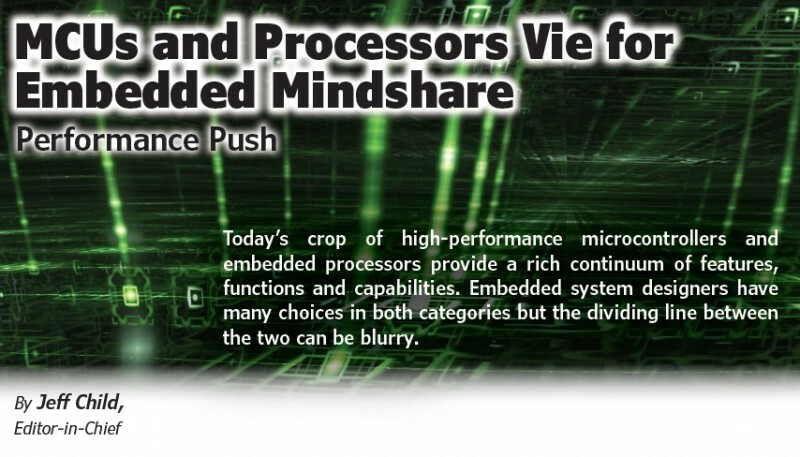 While most embedded processors can run OSes like Linux, most MCUs lack the memory architecture required to do so. Breaking that barrier, in February MCU vendor Microchip Technology unveiled a System on Module (SOM) featuring the SAMA5D2 microprocessor. The ATSAMA5D27-SOM1 contains the recently released ATSAMA5D27C-D1G-CU System in Package (SiP) (Figure 2). Renesas Electronics has announced the sample shipment of the industry’s first on-chip flash memory microcontroller using a 28 nm process technology. To contribute to the realization of next-generation green cars and autonomous vehicles with higher efficiency and higher reliability, the RH850/E2x Series MCU incorporates up to six 400 MHz CPU cores. According to Renesas, that makes it the first on-chip flash memory automotive MCU to achieve processing performance of 9600 MIPS. The new MCU series also features a built-in flash memory of up to 16 MB as well as enhanced security functions and functional safety. 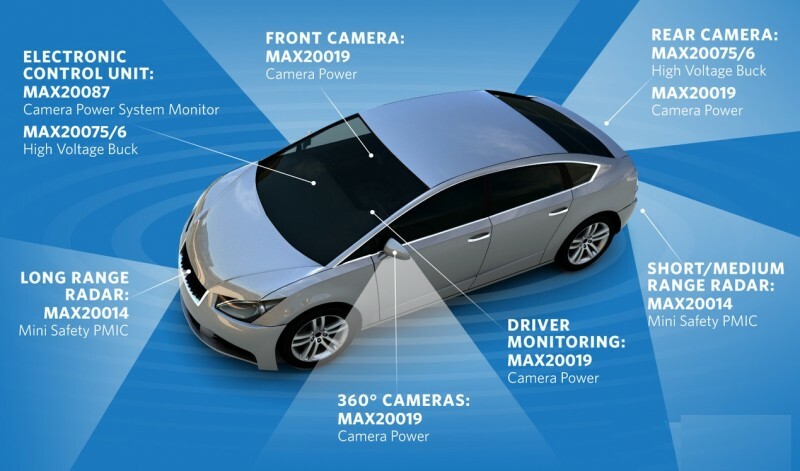 Under Renesas Autonomy, an open, innovative and trusted platform for assisted and automated driving, Renesas provides end-to-end solutions that advance the evolution of vehicles towards next-generation green cars, connected cars and autonomous-driving vehicles. There are two main pillars of the Renesas Autonomy Platform. One is this new 28 nm automotive control MCU. And the other is the R-Car Family of SoCs designed for cloud connectivity and sensing. Car OEMs and Tier 1 manufacturers, such as Denso, have already started to adopt the new 28 nm MCU. Reasons cited include the MCU’s superior processing performance capable of developing next-generation fuel-efficient engines, as well as its scalability. Scalability is important because of the expected electronic control unit (ECU) integration to come from changes in automotive electrics/electronics (E/E) architecture. Following the development of the 28 nm embedded flash memory in February 2015, Renesas announced its collaboration with TSMC on 28nm MCUs in September 2016. The company today hit a major milestone by reaching sample shipment of the world’s first 28nm embedded flash memory MCU on the market. Renesas has already succeeded in verifying large-scale operation of fin-structure MONOS flash memory targeting 16/14nm and beyond generations of MCUs. As the leading supplier of automotive semiconductor solutions, Renesas is committed to advancing the industry through continued technological innovation to achieve a safe and secure automotive society. 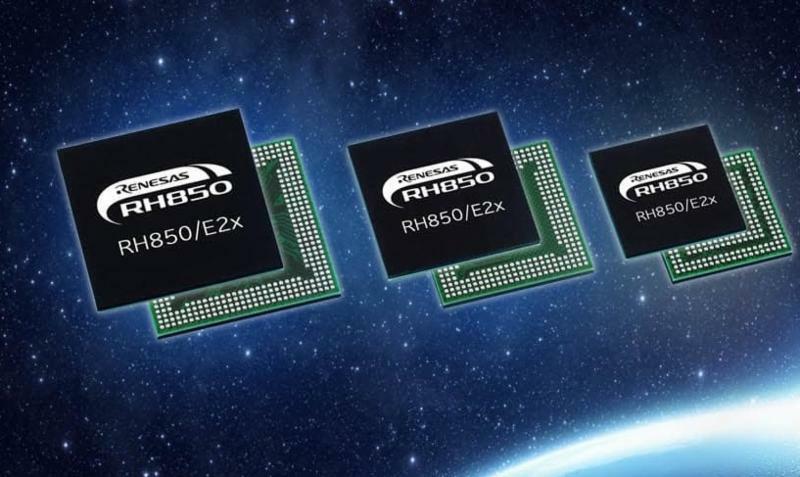 To assure scalability in the RH850/E2x Series, in addition to the 28 nm flash memory MCU, Renesas has also launched a 40 nm process MCU. Samples of this MCU are available now. Samples of both 28 nm and 40 nm MCUs from RH850/E2x are available.